I love tofu. Love it raw, love it dried, fried, shredded, diced, pressed, in soups, in sheets, in stir-fries, in braises… Back in the day, when I mentioned tofu to white people, they would make a face and say, “yech!” But as granolas and vegetarians grew in numbers, so did tofu’s popularity. I’m not vegetarian. I love animals and I love to eat them. That doesn’t mean that I don’t like vegetarian food. One of my favorite haunts in Monterey Park was a Buddhist vegetarian restaurant (Happy Family – anyone know where it went? It’s now an empty lot). Asian vegetarian food is really Effingham delicious. Whenever I visit my Grandma in California, she insists on sending me home with several times the volume of my duffel bag in food. Let’s see, she’ll hand me a few pounds of fruit, several packages of Chinese snacks, lots of dried goods, and a “loaf” of her homemade Chinese vegetarian chicken. I love that stuff. She taught me how to make it a few years ago, but I never tried until yesterday. Vegetarian chicken?! That’s the translation of su ji. From what I’ve gathered, Buddhist monks were masters of preparing tofu in many delicious ways. They are vegetarian. I don’t think they eat garlic either because it is the root of the plant, thus destroying the plant. Emperors used to dig this style of food and would have the monks prepare meals for them. Well, you don’t just prepare any old slop for the Emperor. They made dishes that mimicked chicken, fish, squid, duck… out of tofu. The monks even went so far as to insert tiny slivers of bamboo to resemble fish bones. I learned about all of this when my parents dragged me to a Buddhist temple in LA for my mom’s college reunion. Don’t be thinking that vegetarian chicken is made with hunks of white tofu. Oh no, no, no. 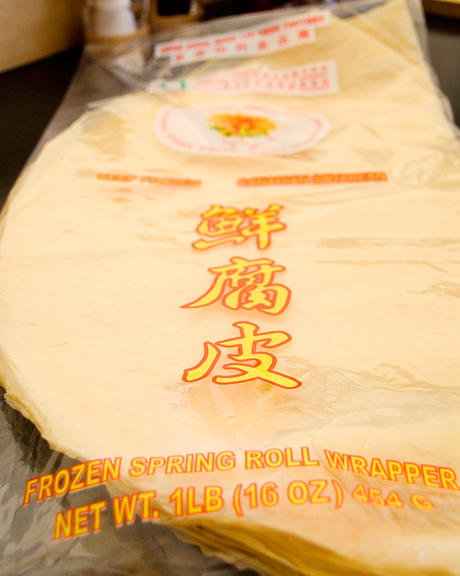 We use tofu skin, also known as tofu sheets. I know of two types of tofu sheets. One is called tofu pi and the other is called bai yieh. Tofu pi is what Grandma uses to make vegetarian chicken. It comes in large thin sheets and is the skin that forms when you make soy bean milk. 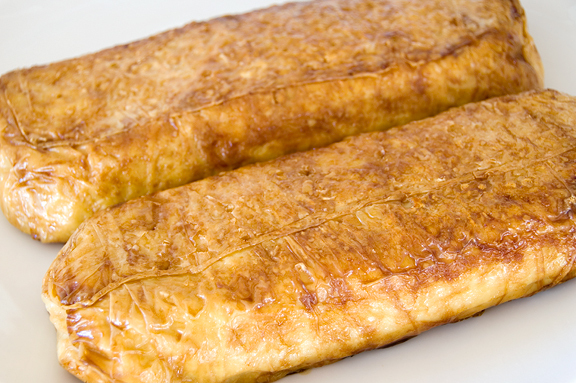 Bai yieh is a pressed sheet of soy bean curd and it has a textured pattern to it if you look closely. It’s slightly thicker than the sheets. You can find it in the refrigerated or frozen section of a good Asian grocery store. 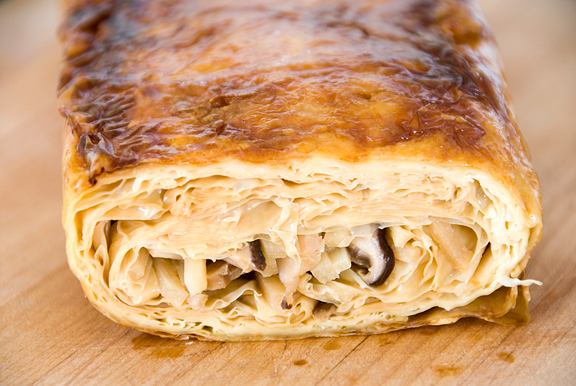 You can make this with or without a vegetable filling. I personally like the vegetable filling. 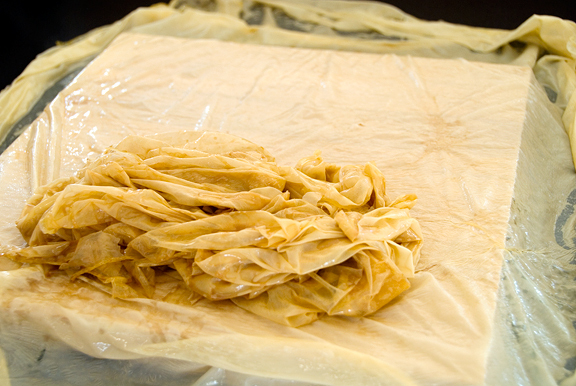 Typically when you open a package of the tofu skins, there will be some broken or torn sheets, some pieces of sheets, and full sheets. I think my package had something like ten sheets and I was able to pick out four that were mostly whole. Grandma says to trim the whole sheets into the largest possible square or rectangle, but I just left them round. If you do decide to trim them, use scissors and trim them while they are dry. Toss the cuttings in with the rest of the pieces and torn sheets. These get rinsed in water, squeezed out, and then soaked in a mixture of soy sauce, sugar, and sesame oil. I sort of screwed up and rinsed the big sheets, which I don’t think I was supposed to do because they get *really* soft and tear easily. I think I was supposed to take a damp cloth and wipe down the big sheets. Oh well. I’m making two loaves from the ten sheets, so two big sheets per loaf. Be sure to wrap the filling sheets around the vegetable in an effort to center the vegetable (mine was sort of centered – I guess you get better with practice). 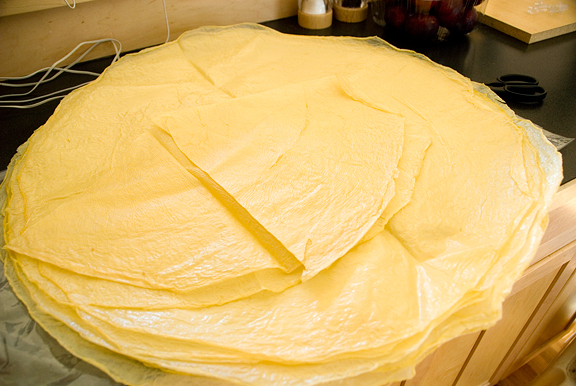 Then carefully wrap the sheet tightly around the filling, sort of like a burrito, except this is huge. The tighter the wrap, the less likely it will fall apart when you serve it. Fold it over once then fold the right side, then fold again and fold the left side. When it is a nice neat package, set the loaf on a second sheet near one side and fold again. Repeat with the remaining ingredients to make a second loaf. 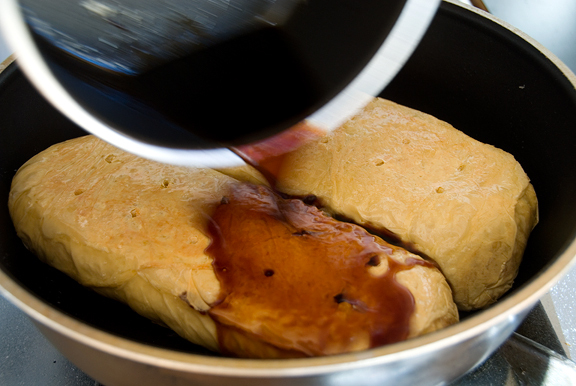 Heat some oil in a large frying pan (large enough to fit the loaves) and fry the loaves for about three or four minutes a side until they are lightly browned. When both sides are browned, take chopsticks and poke several holes in both sides. If you have leftover sauce from the skins, pour that over the loaves, cover the pan and let it simmer for about four minutes a side (yes, flip it once). If you don’t have leftover sauce, make some more like I had to. It’s generally best to slice the loaves when they are cool, because they tend to fall apart when they are hot. Slice the loaves about 3/4 inch thick and serve. 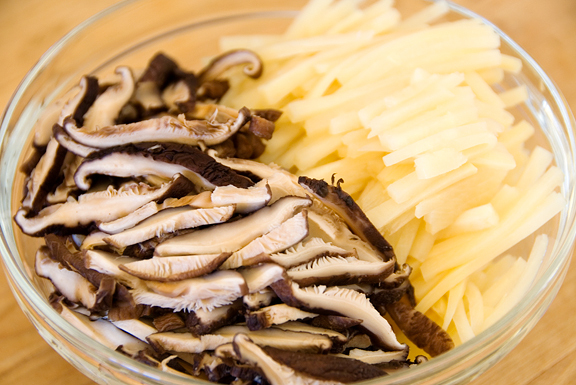 If you make the recipe with vegetables, stir fry the mushrooms and bamboo shoots together in a tbsp of vegetable oil and set aside. In a saucepan, combine the soy sauce and sugar. Stir until dissolved and bring to boil. Remove from heat and add sesame oil and 1/2 cup water. Let the package of tofu sheets thaw. Select out the whole, untorn sheets. You will need two whole sheets for each loaf you plan to make. You can trim the “good” whole sheets to the largest possible rectangle with scissors and set the trimmings aside with the torn sheets. Rinse the trimmings and torn sheets under cold water and squeeze them out. Soak the wet tofu sheets in the sauce and mix well for even soaking. Take a clean, damp cloth and wipe down the whole sheets. Place two sheets on a clean work surface. Grab a handful of the soaking tofu sheets and wipe down both sides of a whole sheet with the filling (to get the good flavor on it). 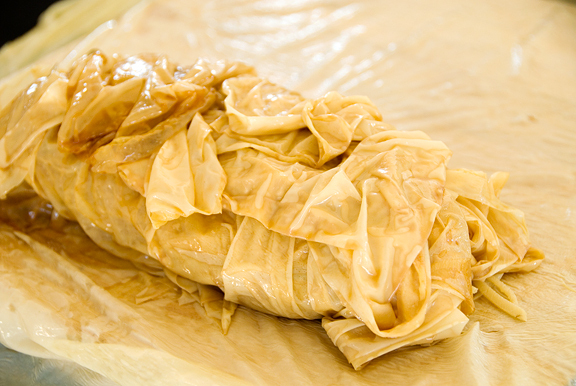 Place a pile of the soaked filling near the edge closest to you on the whole sheet. 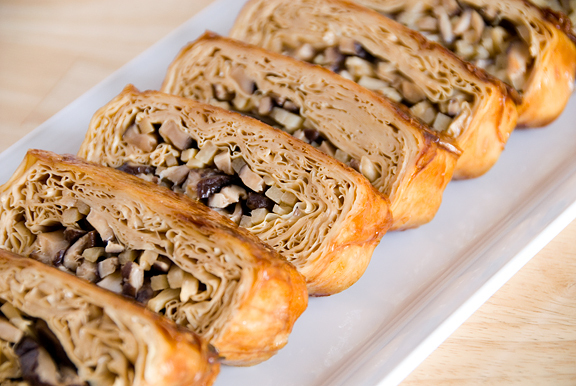 Add vegetables on top and place more soaked filling on top and wrap it around the vegetables to keep them centered. Reserve the sauce. 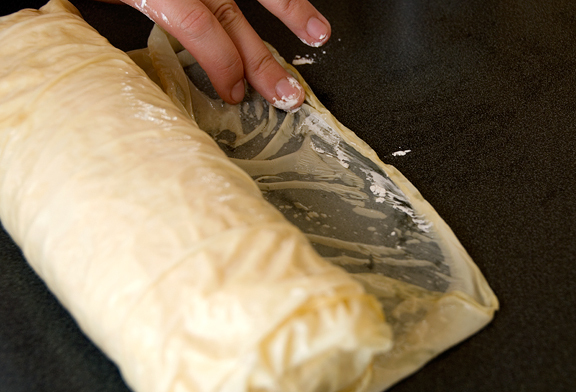 Fold the sheet over the filling, wrapping it into a tight, rectangular package. Fold with the second sheet the same way. 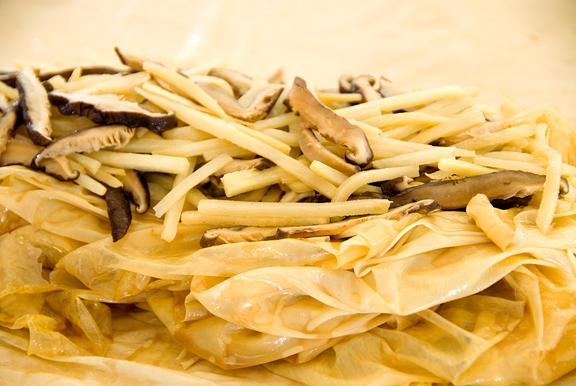 Seal the edge by wiping cornstarch along the edge and folding it onto the damp tofu skin. If you have more material, make another. Heat vegetable oil on medium high in a pan large enough to accommodate the packets. Sear the packets on both sides for a few minutes. Poke holes in the sides. Pour the remaining sauce over the loaves and cover the pan. Allow the tofu to simmer on medium to low heat for 4-5 minutes, flip, and simmer another 3-4 minutes. Remove from pan. You can serve sliced, hot or cold, but I think slicing is much easier when it is cooled. Oh I love su ji! My grandpa would make it for me when I was little, but he would press his, or bind it in cheesecloth to form a more solid chunk. Thanks for the recipe! I will have to try this one out! Wow! This looks a bit tricky, but I’m sure there is a knack to it that comes with practice. I’m looking forward to trying it! I love how you have set out the recipe with the photos. Excellent photos by the way. I will certainly give this a go. Very nice idea with this Chinese vegetarian chicken recipe. It looks delicious. This is one of my favorite Chinese dishes. I never thought of it as something I could make myself! Wow, that looks pretty good. It’s probably a little too tough for me to tacklet.. but how close does it get to the texture or taste of chicken? wow, that sounds incredible…and complicated at the same time! But I love how clean and nice it looks at the end…. Rosa – great! I hope it works for you. It tastes great no matter how it looks. Aoife – I didn’t either, until one day I asked my grandma to show me. It’s nice to know that we can make it too. Danny – I never thought about whether it tasted like or felt like chicken. I just love this dish for what it is – delicious. just wanted to let you know Happy Family is still in Monterey Park. They just moved to the big red plaza at the corner of Atlantic and Garvey. i had actually dinner there last week. i love the fried bread and their chicken. Oh, this is wonderful. I love this dish, but never tried to make it at home before. Your instructions are very helpful. Chocolate Lady – I’m so glad it’s helpful! I never would have known how to make it if I hadn’t asked my grandma to show me. I know it looks like a mess (it is a mess) until the end, but it’s worth the trouble to me. I love this dish too. Pepy – yup! It’s one of my favorites! I think I am in love with your blog since you have English recipe for Su Ji! great recipe, I have been looking for this for a while. I went to four asian supermarkets in fresno today, I cannot find tofu skin anywhere. does anyone have any suggestions? Kim – Fresno… hmmm, I would try anyplace in SF, but I don’t know of anything in Fresno – sorry! happy family… if i’m not mistaken it’s still there on the intersection of new ave and valley ave, next to abc bowling, unless it’s been a few years since you’ve visited and it has relocated from its original place. i’ll definitely try it sometime – i’m trying out this vaguely vegan thing (have to wean myself off the seafood, which i was bred on, sigh! ), so thanks for the recommendation! i love the photography on your blog btw, and (if my comment wasn’t a giveaway) i actually live in monterey park, but i’m attending school in chicago right now. thx so much for the traditional recipes (that my parents never taught me before i headed to the midwest) that make me so nostalgic and just a tad homesick in the best way possible. cheers! Elle – it’s somewhere around there, but I haven’t been in a while. You’re welcome and I hope you find the recipes relatively straightforward! Chicken Coop – did you try clicking on the subscribe link? ohhh man i love this stuff, do you possibly know any other vegetarian chinese dishes? your food always looks so yummy and makes me think of home… i just tried making kao fu, but its nothing like my roomate’s moms…. Elaine – well, aside from dishes that have vegetables, tofu, or noodles without meat – not really ;) sorry. Thank you so much for this recipe! Your photos were excellent and your instructions so easy to follow. I hope you don’t mind that I’ve adapted it slightly and posted my version on my blog, with links back to here. Though I didn’t have exactly the right ingredients, the results were delicious, a dish that my whole family wants me to make regularly. 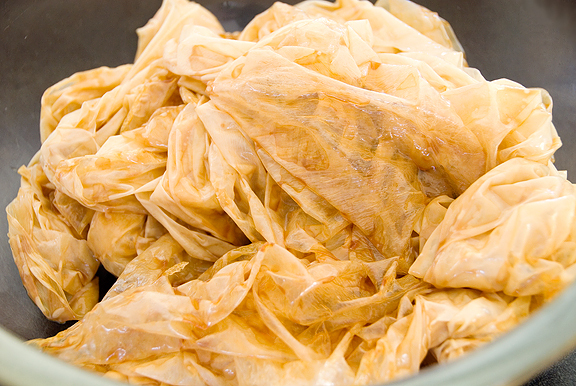 Bryanna suggested; If using the dried yuba, soak the sheets (handle carefully) in warm water 5-10 minutes, then pat them dry and cut them. Cute name for a recipe! It sounds really good though as I love tofu as well. I’ll give it a try this week. Cheers, Edith. Bet your family has to be reeeaaal careful around you not to be eaten. I must admit I was not a fan of Tofu for years, but have recently tried it again and am amazed at how versatile it is. So nice to see detailed recipes like this for this great product. Great photos! Love the idea of using mushrooms as a source of meat. Can’t wait to try this one out! Can I use normal spring roll skin? Mia – no, they would get soggy and break apart.